Dots and dashes – they’re everywhere, man! When my daughter was at summer camp one year, she and a friend devised a secret code. It involved different configurations of coughs, sneezes, pencil taps, and throat clearing sounds, and it enabled the two girls to communicate during quiet time. Slightly evil and remarkably devious, perhaps. Hilarious? I thought so. So did one of the counselors, when I told her about it years later. We shared a good belly laugh over it. People have been communicating without words for centuries, from drums to smoke signals. 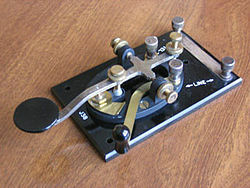 One of the best-known methods in our day and age is Morse code, although already it’s becoming something of a lost art. In my book, THE VOLUME OF WATER, one of my main characters, Mary, is a HAM radio nut. Back in the 1960s, when my novel takes place, you had to be proficient in Morse code to get your HAM license (that’s no longer the case). Mary, lonely kid that she is, is an extreme audiophile. She hears Morse just about everywhere. A bird, her heartbeat – it’s all translatable for her. In other worse, the world literally speaks to her through Morse. She’s not the first one to feel that way, I was rather surprised to find. A quick and unscientific Google search proves that Morse is sort of everywhere. Every subject has its nerds, and that goes for birdwatchers and rock-n-rollers as well. 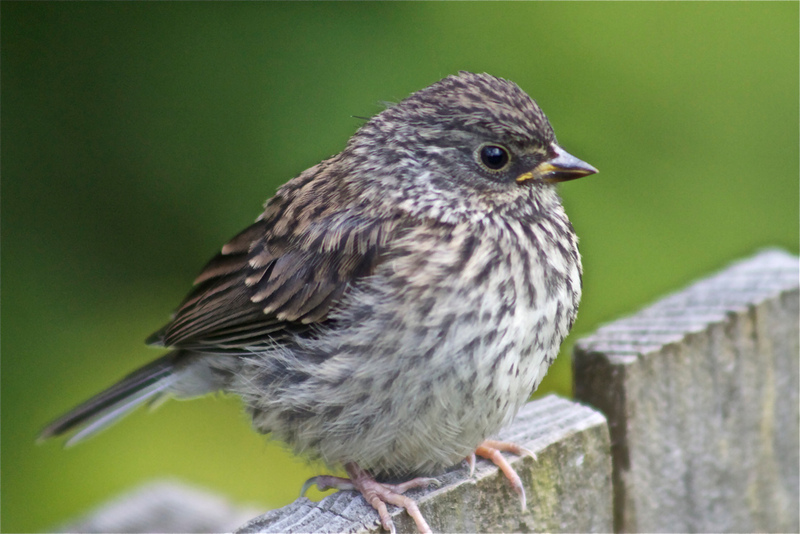 Case in point, the Junco hyemalis oreganus, also known as the Morse code bird. Here’s a sampling of their sound, courtesy of the Cornell Lab of Ornithology. Fortunately, learning Morse is relatively easy. There are several sites that will even translate normal type into code for you so you can impress your friends. Can you guess what hopeful bestseller this is? – …. . / …- — .-.. ..- — . / — ..-. / .– .- – . .-. I typed the title of my book into a Morse code music making page I found, and now I can’t get the rhythm out of my head. I think it’s a rhumba. Either that, or headhunters will be here shortly. Hmmmm, wonder if there’s a way to incorporate subliminal audio messages into a query letter? On March 27, 1964, at 5:35 pm,residents of Alaska were heading home from work, making dinner for their families, getting ready to attend services (it was Good Friday). At 5:36 pm, a 9.2 megathrust earthquake violently shook the state. All over Southcentral Alaska, buildings collapsed, man-sized fissured appeared in the earth. Some houses literally slid into the sea. Fuel containers caught fire. Trains derailed. Within an hour, tsunamis struck coastal regions and small islands that were home to dozens of canneries and small fishing towns. 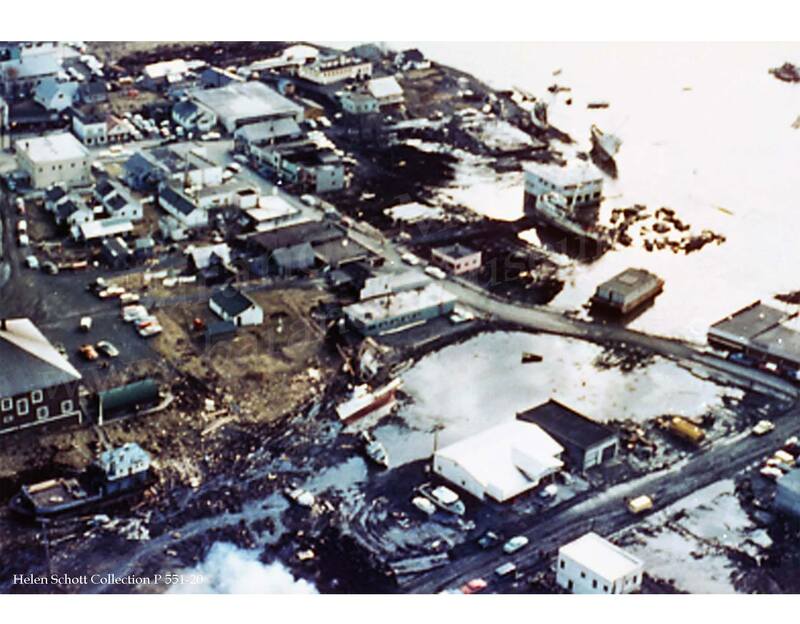 Local tsunamis caused by calving ice walls hit almost immediately; tectonic tsunamis from father out in the ocean shortly afterward reached as high as 50 feet when they slammed into the island of Kodiak. One wave completely wiped out the village of Chenega, killing a third of its residents. 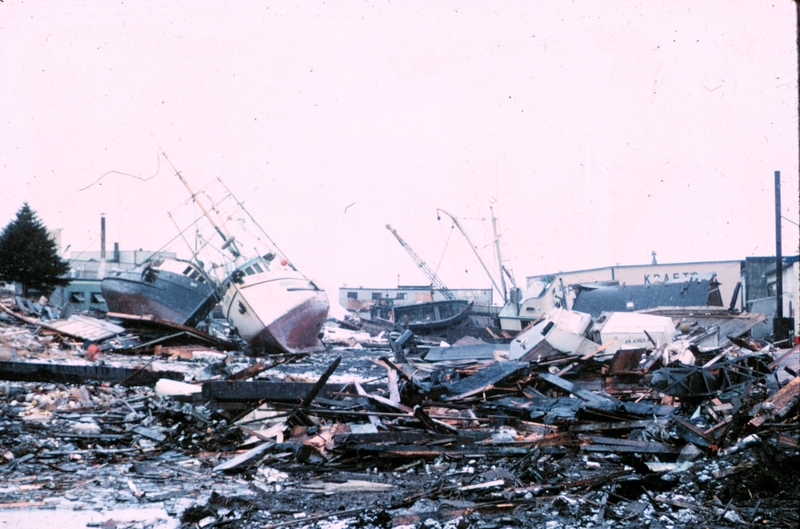 My novel-in-progress, THE VOLUME OF WATER, is set in Kodiak and the surrounding islands in 1964, and I’ve done a lot research into the devastation caused by the quake and tsunamis. It’s terrifying to think that something could happen so unexpectedly and literally wipe out your way of life forever, but that’s exactly what happened.Some villages were so badly devastated that the residents chose to move elsewhere rather than try to rebuild. 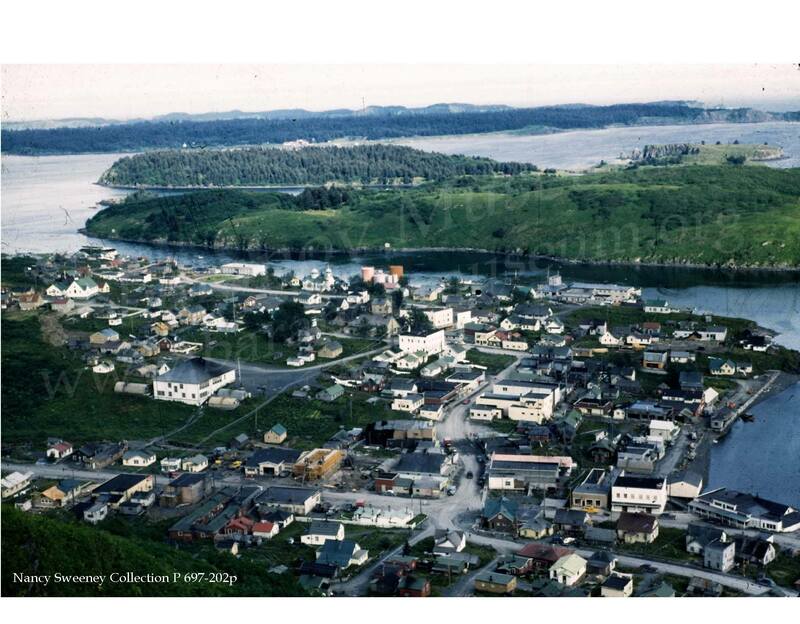 The town of Port Lions, on Kodiak Island, got its name when villagers from the decimated island village of Afognak relocated there – with the help of the Lions Club. For those who lived through it, and those who lost loved ones, every day is remembrance day. 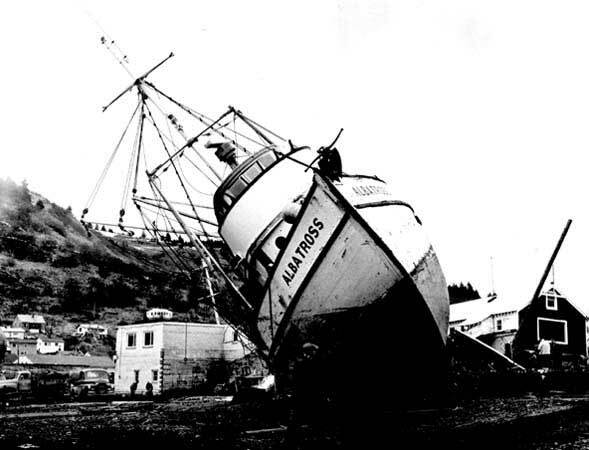 In researching personal accounts of the 1964 Good Friday Earthquake for my novel THE VOLUME OF WATER, one of the things that stood out to me was the amount of damage that occurred in the first few minutes of the quake. Fortunately, the quake, a 9.2 megathrust which was the largest ever recorded in the Northern Hemisphere, occurred during the day – at about 5:30 pm. It happened just after people had vacated office buildings in the busy Downtown Anchorage area; experts have stated if it had happened an hour earlier, hundreds more may have been killed. I cannot imagine how much worse the devastation would have been if the initial quake had occurred at night. At least in the daytime, people can see debris falling toward them, they can see the earth literally coming open under their feet. In the daylight, we can find and hold onto our loved ones. If we have to, we can see to grab out coats and boots before we run out of a collapsing building or home. Anyone living in the area of the Pacific Northwest known as the Rim of Fire knows that another “big one” could be just around the corner. Most prepare to some degree for such an event. However, since disaster can strike anywhere at anytime; it is important to be able to react quickly in those first few minutes. How many of us are prepared to do that? Last year, to commemorate the anniversary of a local fire, I did an article for the Frontiersman Newspaper in which I interviewed the spokeswoman for our borough’s emergency preparedness department . What I expected was the same information everybody gives out – have canned food on hand, stash some candles and blankets, lots of water, etc. Instead, the first thing that came up was … tennis shoes. Um … no. Probably not. One likes to hope, if disaster must strike, that it doesn’t happen when it’s dark or 20 below outside, but then, I live in Alaska – what are the odds? That thought haunted me. We are a large, homeschooling family. That’s code for “our entry way is usually a hot mess of random shoes, socks, mittens, hats, projects, books of all shapes and sizes and the occasional sharp Lego toy.” If I had to get my family out of the house in a hurry, especially in winter, we’d all be in deep trouble. The preparedness spokeswoman pointed out that if a large quake occurs, it’s possible – even likely – the floor will be covered in broken glass (and, of course, Legos). So it’s a good idea to stow a pair of tennis shoes (sturdy shoes that can be slipped on easily) under each bed. Some people keep a large ziplock bag under the bed with their shoes, a light jacket, flashlight, maybe a whistle, and other must-have items (like an inhaler if you have family members with asthma, which we do). You can even secure the bags to the frame of the bed so they don’t get pushed back out of reach. I am working toward the goal of going to bed at night with an entry at least organized enough that everyone could find their own coat and boots with a flashlight. We’ve designated specific places in the house for those flashlights, too. 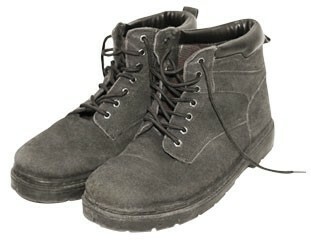 I now sleep with a pair of shoes or boots next to my bed that I can slip on in an instant. I keep my iPhone charged at night, and I have an app for it that provides a quick flashlight. I keep it and my keys on my nightstand, an arm’s reach away. My older kids know how to open the garage door if the power goes out, so if the house becomes unsafe and it’s too cold to remain outside (which it is much of the year), we can pull the car out and at least be out of the elements. I read enough first-hands accounts of the devastation that occurred after the 1964 quake, and the tsunamis that hit the coastal regions afterward, to believe that those first five minutes can be key to survival. Maybe you don’t have earthquakes in your neck of the woods, but I bet you have fires, or tornadoes, or riots, or something else equally dangerous and unpredictable. Having a pair of shoes and a plan to survive the first few minutes of an emergency is easy and inexpensive, and it might make all the difference to you and your loved ones. Do you have a “5-minute bag?” Is there anything I’ve forgotten? If you have any tips or advice, please let me know in the comments section! Thanks! Maybe I’m a little crazy, but the proportions of the meal look different. The bag of fries looks almost as big as the burger. I won’t even go into the whole “100% pure beef” claim. That was then and this is now. I was surprised to learn that McD’s wasn’t the first fast-food restaurant in America. Actually, that title goes to White Castle, of the famous sliders. White Castle was founded in 1921 in Wichita, Kansas – at the corner of First and Main streets. How all-American can you get? Far more interesting, I think, is the not-remotely-American versions of the Big Mac that can be found around the world. In Egypt, for example, you can order a McFalafel. In Indonesia, all meals are certified halal, and you can order McRice and McSoup, a chicken flavored soup with bits of croutons and vegetables, to go with your McSatay, a hamburger with satay sauce and Buryam. In Japan, your Teriyaki McBurger will be made with ground pork patties, mayonnaise, lettuce, and teriyaki sauce, and you can dip your Ume (Chicken) Nuggets in plum sauce. Menu items in the Philippines include McSpaghetti, Chicken McDo, Burger McDo, and the Hamdesal – a Pandesal bun with pineapple glaze syrup, mayonnaise, and Canadian bacon served with scrambled eggs, cheese, or both. McDonald’s in Cyprus sells the Greek Mac, a Big Mac variant with pita bread and tzatziki sauce, and the Greek Chicken, a Greek Mac with chicken patties instead of beef. A shrimp burger is also sold during the period of Lent when Orthodox Christians (of which I am one) don’t eat meat. Clearly, I am living in the wrong country. 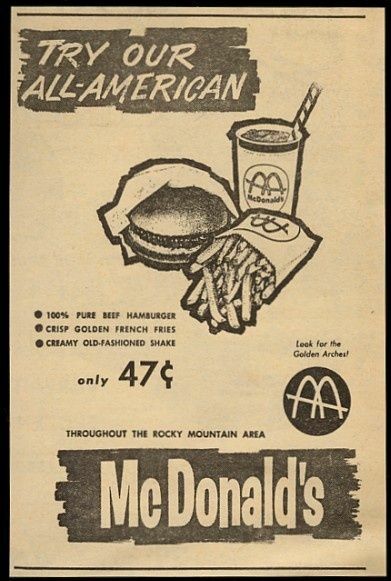 That 47-cent price tag, though! I ran that through an inflation calculator, and it turns out that’s equal to about $3.57 in 2015 dollars. I’m not sure where the data is based on, because here in Alaska the typical regular-sized meal (with a Coke, not a shake) costs double that, easily. In any case, sorry if you’re craving a burger now. I know I am .Some things never change. Probably just a passing fad. 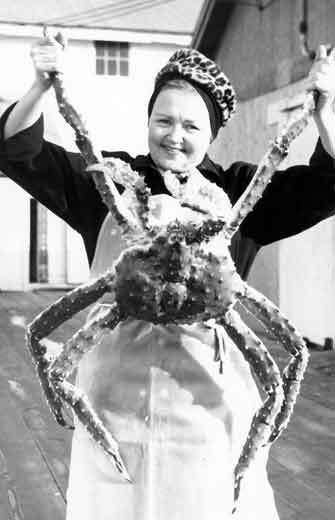 In 1964, the Alaskan king crab industry was just taking off. Monsters like this guy were not rare. Working the cannery line was miserable, and made for a long, long day. But the industry brought work to Alaska’s remote coastal towns. In the early days, catches of up to 3,000 king crabs a day were not uncommon, with individual crabs weight 8-10 pounds each. Somebody pass the garlic butter. As March 27th approaches, it’s hard to get earthquakes off my mind. Below is a great short film by the U.S. Geological Survey that reveals the scope of the biggest earthquake ever to hit the Northern Hemisphere, the Good Friday Quake that hit Alaska on March 27, 1964. The ’64 quake lasted over four minutes. That’s a ridiculously long time for an earthquake. Four minutes is how long it takes Elsa to sing “Let It Go” in the movie Frozen. It’s how long hard-core, Olympic-level runners run to reach a mile. In four minutes on a typical day in the United States, 30 babies are born, 38 people die, and 4,080 Big Macs are eaten. Four minutes in a 9.2 earthquake is forever. Watch the video. When you’re done, check your watch. The video below – four minutes and four seconds long – is shorter than the quake itself. It is difficult for non-writer types to understand this, but spending time on Twitter is a very important part of being an author. So is a dedicated LOLZ board on Pinterest, a platinum Visa card attached to your Amazon account, and a solid subscription to Netflix. But I digress. Most often when you tell people you’re a writer, they imagine that you spend the day in your pajamas, drinking hot chocolate and dawdling on social media, getting all the words down only after midnight when lesser mortals sleep. That’s only partially true – I personally drink Diet Mountain Dew. And also, generally, unless the fever to write hits me first thing in the morning, I get dressed. However, I do scan my twitter feed several times a day. This is a legitimate tool for me as a writer; there’s an unbelievable amount of information tweeted hourly regarding how the publishing industry works, what agents are looking for in new clients, and the dos and don’ts of being a Real Writer. You just have to know where to look. So toward that end, I’m sharing my favorites in the Twitterverse. This is not a comprehensive list by any means, and of course it reflects my personal bias toward sarcasm and snark. 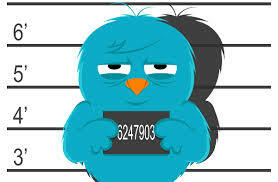 Please forgive any omissions – if I’ve forgotton anyone important please let me know! If you do nothing every day but brush your teeth and check your Twitter feed for #tenqueries, the day is well spent. Literary agent Margaret Bail (Inklings Literary Agency) goes through the slushpile of queries in her inbox and in 140 characters or less tells us whether the query gets moved to the junk file or she requests part or all of the manuscript in question. There are far more passes than requests, however, and watching this hashtag gives awesome insight into what most querying writers do wrong. Plus, her avatar is a cupcake – pure literary genius! 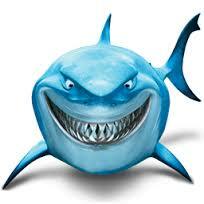 This is the Twitter feed of the snarky shark of agentdom, Janet Reid of Fine Print Literary Management. She reps uber-author Patrick Lee, which tells you right there she’s Awfully Darn Cool. By following her feed you’ll get witticisms and links to her blog, on which she posts and answers typical questions from would-be writers and also hosts the semi-famous 100-word contests, which are brilliant and fun. Anything you ever wanted to know about querying but were afraid to ask is answered on her blog under QueryShark, and if you’re not skeered of shark bites, you can submit your own query for evisceration. Be afraid. Writers are friends, not food. You know, when I initially stumbled across this hashtag, I thought it meant there was finally a chance for us females to get inside the head of men. As in, ask-a-gent. Because I’d really love for someone to explain to me the huge appeal of incendiary salsa and also bewbs. Sadly, this is not that. It is, however, another oppurtuity for would-be writers to get inside the head of agents by directly asking them their most awkward burning questions in front of thousands of people. Watch the hashtag for when the agents are available, and grab the popcorn. What writer wouldn’t love someone named for the agony and angst all of us experience in the query and sumbission trenches? Literary Rejections not only feels for us, man, they post all kinds of upbeat suportive tweets, plus infomation on new agents hungry for fresh meat – I mean, new talent, conference info and other cool, writer-y stuff. Another agent extrordinaire, Jessica Sinsheimer of the Sarah Jane Freymann Literary Agency. 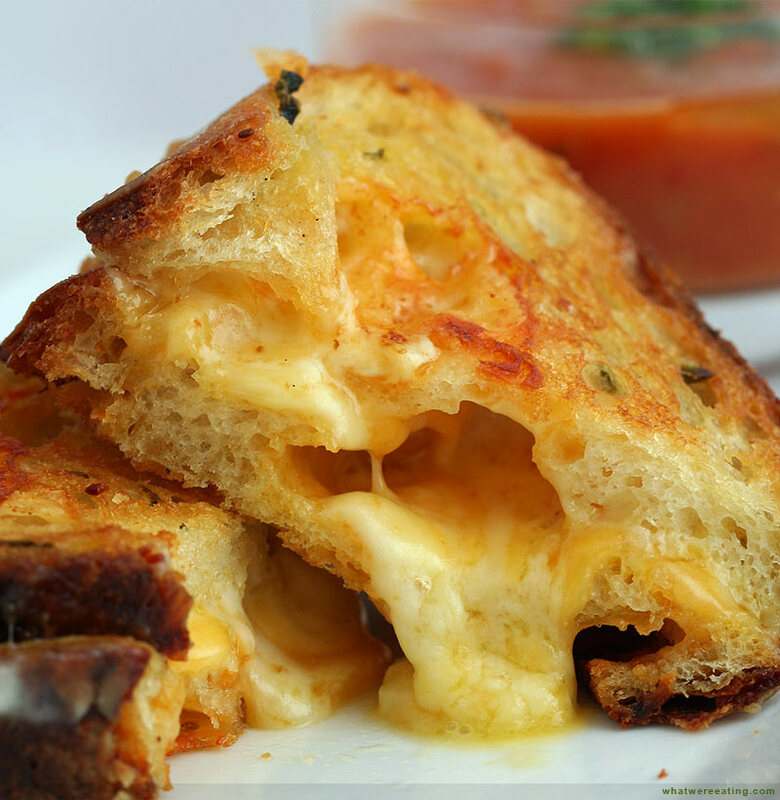 Not only does Ms. Sinsheimer post cool stuff about writers and books and stuff, she also loves food, and tweets these ridiculously mouth-watering recipes and photos. Especially cheese. Also, she occasionally hosts hilarious high jinks like the Bad Query Contest. That PBJ doesn’t look so hot now, does it? Don’t get me wrong. The real #pitmad – a contest of sorts where writers pitch their query in 140 characters or less to agents perusing the hashtag – is very near the pinnacle of awesomeness. But holy cow, if the the sarcastic and witty #fake version doesn’t make you pee your pants, you need to take your sense of humor in for a tune-up. Wait, you’re not already following Dahlia Adler on Twitter? What the hell is wrong with you? We’ll wait while you go fix that (taps foot). There. Not only is Miss D a brilliant writer in her own respect, she’s also the owner of the stellar blog dailydahlia.wordpress.com, which features author spotlights and all kinds of great advice. This is the hashtag for writers who should be writing but whose brains are ready to explode and so they’re on Twitter instead. Because all they really #amwriting at the moment is a 140-character public bubble of agony. At least it’s fun to commiserate. Subtle variants of this hashtag include #writing, #amediting, #amrevising, and #amdrinking. This beautiful bit of beautiful in a harsh, ugly world was started by literary agent Terrie Wolf of AKA Literary, who understands that writers have FEELS, dammit, and need encouragement from time to time. When you’re at that point where you can’t decide whether to pour kerosene on your laptop and light a match or drown your troubles in a five-pound bag of Sour Patch Kids, go to the hashtag first. You’ll feel better, I promise. So that’s my Top Ten on Twitter. I’m sure I left out some good ones. Let me know what I forgot! I’ll check the comments as soon as I finish this bag of Sour Patch Kids and get dressed.